“We think we've built software that is a general purpose solution to some set of problems, but we are almost always wrong. 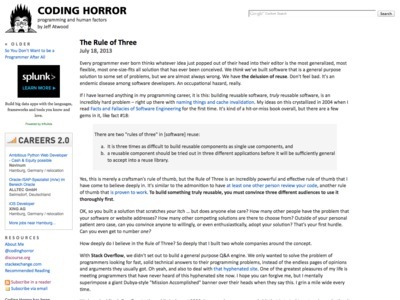 […] To build something truly reusable, you must convince three different audiences to use it thoroughly first. […] One customer or user or audience might be a fluke. Two gives you confidence that maybe, just maybe, you aren't getting lucky this time. And three? Well, three is a magic number. It’s also true at a smaller scale: The APIs and formats and configuration settings internally used by our software need different use cases as well to prove that they’re well-designed. It helps that DC-X offers a lot of its functionality via UI, Web service, command line and PHP API (see Five faces of a Web app). Still, lots of areas remained “one-hit wonders” though we tried to make them reusable.